Salman Khan’s Da-bang tour has been in news for the past few months now and sister Arpita Khan along with some B-town celebs were spotted leaving for the show in London. Celebrities from Bollywood were snapped leaving for London for Salman Khan’s successful Da-bang tour to be held in London. The airport welcomed Arpita Khan along with son Ahil, Daisy Shah, Sonakshi Sinha and Jacqueline Fernandez as they were leaving for London for the show. Salman was filming for his upcoming film Tiger Zinda Hai in Abu Dhabi for more than a month and has now left for London. The Sultan actor posted on Twitter, “Leaving #AbuDhabiafter a great schedule of 50 days for #TigerZindaHai, had a wonderful time.” Salman will be there in London for the show which is scheduled on September 17, 2017. Sonakshi was seen in a black attire for her travel schedule while Jacqueline was seen in a comfortable orange outfit. 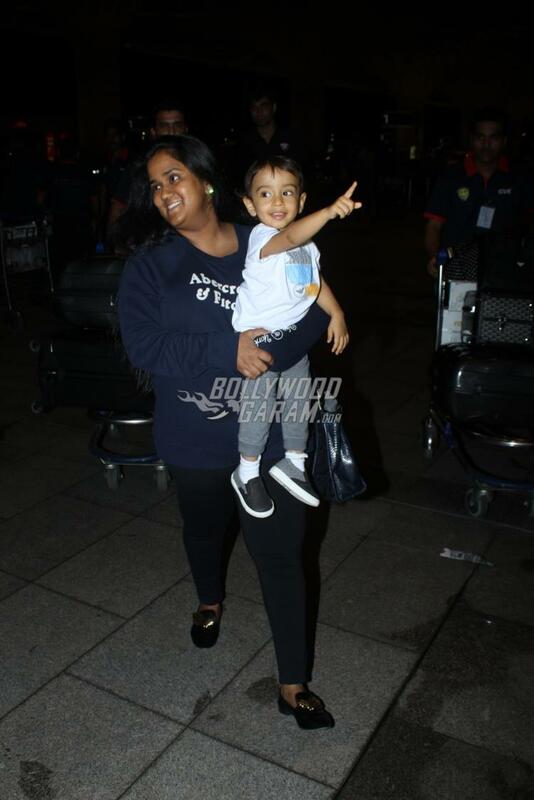 The one who caught everyone’s attention was Arpita Khan and her son Ahil, who enjoyed the attention from the paparazzi as he was caught in a playful mood. Exclusive photos of Arpita Khan, Jacqueline Fernandez, Sonakshi Sinha at the airport!